baseball | The Jamestown Comet. PASADENA, CA – Baseball New Zealand this week has secured the services of Jamestown, Ohio native, Fred Claire, former Executive Vice-President and General Manager of the Los Angeles Dodgers Major League Baseball organization, as a special advisor to the organization. Flynn said Claire has been advising the country’s national body unofficially for some time, but added that the program is now at a critical juncture and the timing is right to formalize this key relationship and take it to the next level. In a distinguished 30-year career with the Dodgers, Claire served the team as a publicity director; vice president of public relations, promotions and marketing; Executive Vice President in charge of day-to-day operations; and Executive Vice President and General Manager in charge of player personnel. Claire suggested that his passion for sports came from early summer mornings in Jamestown when friends would throw pebbles at his second-floor apartment window. This was, according to Claire, “the indication that it was time to get up, get the baseball equipment and head out to the diamond at Silvercreek School.” He was referring to the historic school at the corner of SR 72 and South Charleston road in Jamestown which was razed in 2013 but, for many years, served as the Greeneview primary and junior high building. 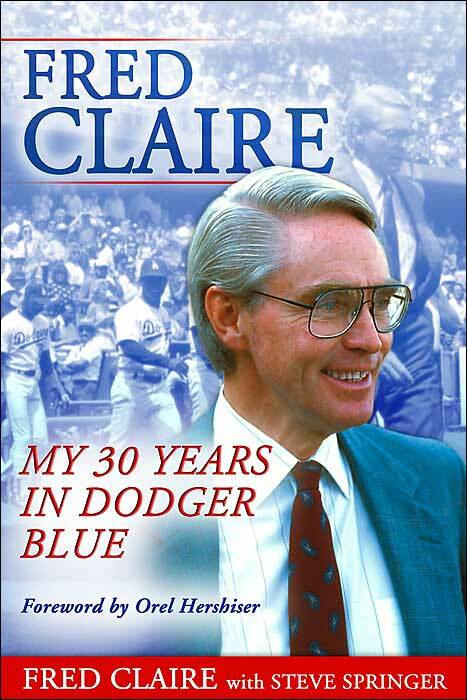 Claire joined the Dodgers in 1969 and he proved to be an award-winning executive at every stage of his career. Claire was directing the team’s marketing efforts when the Dodgers first hit the three-million mark in attendance and established a period of record-setting attendance figures. In April of 1987, Claire was named general manager of the Dodgers and when the team won the World Series in 1988 he was selected Major League Baseball’s “Executive of the Year” by The Sporting News. Claire became the fifth Dodger executive in the team’s history to win the award, following Larry MacPhail (1939), Branch Rickey (1947), Walter O’Malley (1955) and Buzzie Bavasi (1959). Since his departure from the Dodgers in June of 1998, Claire has maintained an active schedule as an educator and as a consultant to a variety of businesses in addition to an on-going civic involvement. He is a partner in the baseball analytic company AriBall.com. “I’ve always had an interest in growing the game of baseball and to have the opportunity with Baseball New Zealand and to work with Ryan Flynn and his group is very exciting,” said Claire. Claire had made a trip to Australia in the late 1970’s and helped to set the stage for a connection between the Dodgers and the Australian Baseball Federation. Dodger coaches Monty Basgall, Red Adams and Guy Wellman traveled to Australia a few years after Claire’s visit to give clinics and promote baseball. “I liked the fact that the baseball officials in Australia were growing the game from the standpoint of placing an emphasis on youngsters learning and playing the game and this is what I see happening in New Zealand today,” said Claire. During his 12 seasons as the Dodger general manager, the team signed pitchers Hideo Nomo from Japan and Chan Ho Park from South Korea. Nomo was one of five consecutive National League Rookies of the Year during Claire’s tenure, joining Eric Karros, Mike Piazza, Raul Mondesi and Todd Hollandsworth.